It’s not every day that you get to introduce something new under the sun. In today’s publishing landscape, almost never. We hope the Mountain Life Annual model fits that ever-changing market—one in which, it seems, a balance of print and digital is actively sought by everyone. Born from the success and popularity of Mountain Life Coast Mountains (in British Columbia) and Mountain Life Georgian Bay (in Ontario) among communities of committed outdoorists, Mountain Life Annual seeks to be a more encompassing, national outdoor voice of record, offering an ear to the ground, an eye to the sky, and a foot in (or out) the door. Our editorial mandate is a broad one: international in scope with Canadian flavours (beer, bacon, maple donuts), and a focus on the issues of our world through the adventures and pursuits connected to them. More athletes and recreators than ever, it seems, are using these actions and connections not only for purposes of their own well being, but as an instrument of education and change. Outdoor pursuits, they are saying, are not simply a way to connect to nature, but a way to connect to ourselves as a species. In other words, the outdoors can show us what really matters—a flag flown conspicuously in our first issue. When you launch something like this, the first question is usually Why? Fortunately we had an answer before we started. In a world of homogenized media that does little more than self-replicate and feed off itself, it was clear there was room and demand for deeper, more meaningful engagement with the outdoor world, one that would benefit from a different aesthetic than a regular newsstand magazine. It was also clear that a limited number of like-minded supporting partners could ensure the production of something that was worth keeping around to return to again and again. After a few silent nods, the next question is usually What will it be like? We imagined a good read, of course, but that it would channel modern sensibilities in relying more widely on the power of imagery—the unavoidable engine of current culture. That’s not a bad thing, of course, since the first camera was an eye and the first film memory. After self-consciousness intervened, human hands became tools of representation: drawing, painting, sculpture, and, eventually, photography. Great photos invite you to not only look at, but through them, back to whatever set the stage, ahead to what happens next. We wonder. We are compelled. Nowhere is the inspiration through visual art more important than in the outdoor world, where it drives everything. We aren’t the first to proclaim this, of course, but pledge to choose photos not based solely on impact, wonder, or even art, but also knowledge, empathy and the experience of participation. Another thing inevitably plumbed is the new book’s architecture. Simple but elegant on that front, we hope. Only a few departments: Offline (an opening photo that immediately places you somewhere other than your desk); Ellipse (a few pithy words like this on that last orbit around the sun we shared); CartoGraphic (a marriage of cartography and graphic art that elaborates on something at issue); Coast to Coast to Coast (a miscellany of people, places, art, environment, and media; no news here is good news—that’s what the website is for); and Wild (a topical parting essay to leave you something to think about). And, of course, features. Four or five big ones laid out with space to breathe in a reader and breathe out the story. Whether investigative, experiential, essay, profile, or photo-driven, there will be epic trips and vast wilderness, backyard adventures and deep culture, but more importantly the characters, motivations, stories and events that dwell beneath each. This much we know: expect the unexpected. Finally, folks will ponder where print and digital might part ways. We hope instead, that Mountain Life Annual bridges a divide in offering the best of both worlds. An exceptional print edition will deliver superbly rendered photos with the look and heft of something you’d be proud to have grace any surface in your home, with no space wasted on the distraction of things that have a best-before date. Digital will comprise the entire print edition in a more portable, state-of-the-art format available on the Apple Newsstand and featuring extras like web links (here is where you’ll find the currency of news, gear or service), videos, slideshows, behind-the-scenes, extended interviews. 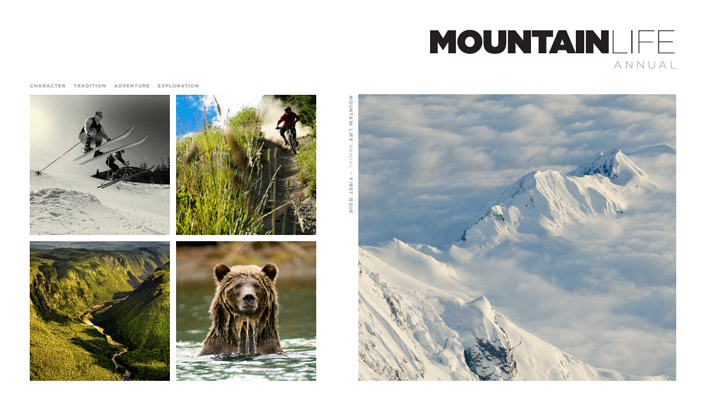 There will also be two digital-only special editions each year, more easily poised to go in-depth about the happenings and watersheds in our world that cycle through the website—a website that will track and sort these things on a more ongoing basis, with daily posts, updates and blogs from Mountain Life editors, writers, photographers and our extended outdoor family. In the end, we can’t really say how it will all come together other than it will evolve organically, like most things on Earth, toward some kind of happy equilibrium that balances all the forces of human expectation. And in that respect, something new under the sun will at least obey the laws of the universe.